As we approach Remembrance Sunday, our thoughts go to the military personnel that have fought and died in armed conflicts. In particular, at CPC we think of the animals that have served alongside our brave military personnel. Last year we wrote about the history of service animals and gave some examples of extraordinary animals. In researching this article, I was struck by the description of some of the animals’ actions that led to them being awarded the Dickens medal, the PDSA animal bravery award. I thought I would share some of them here. A pigeon called Kenny Lass was parachuted into occupied France with an agent. Released 12 days later, she was the first pigeon to deliver intelligence after flying 300 miles in just 7 hours. Mr E King, An air raid warden, found and rescued Rip after a particularly heavy bombing raid on Poplar, London in 1940. A mixed breed terrier Rip became the service’s first search and rescue dog. Rip is credited with saving the lives of over 100 people. Rip was awarded the Dickens Medal in 1945. 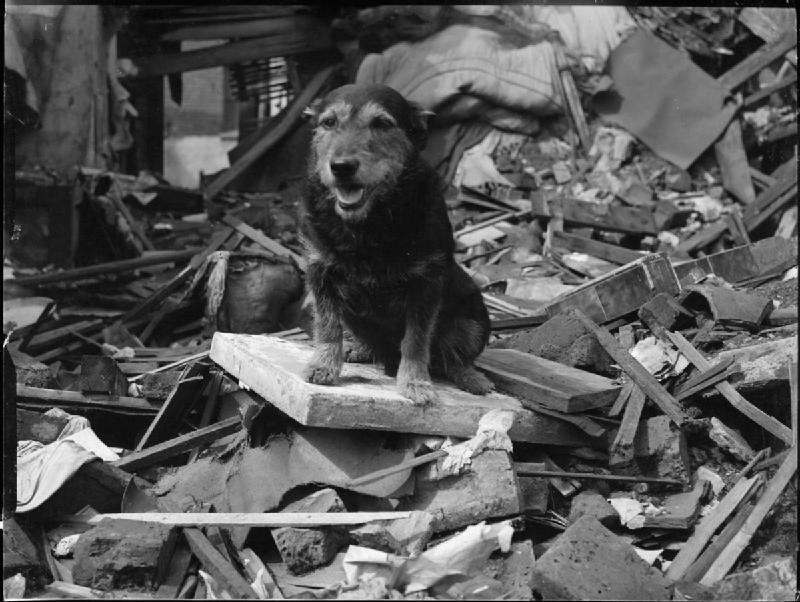 IWM caption : Air Raid Precautions dog ‘Rip’ sits on top of a pile of brick rubble and timber, following an air raid in Poplar, London. In 1945 the Dickens Medal was awarded to a pigeon called Dutch Coast. He was placed on a bomber to relay an S.O.S in the event of the plane being shot down. The bomber was forced to ditch in the water near the Dutch Coast. The bird was released and flew some 288 miles in 7.5 hours in poor conditions. He carried the S.O.S message to RAF Syerston in Nottingham. 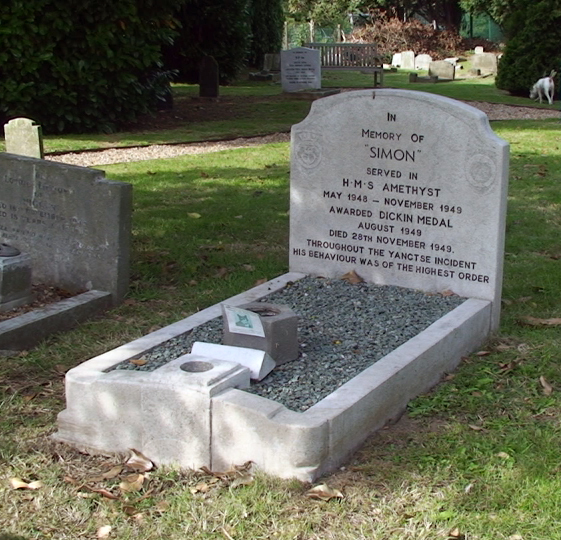 Simon was found wandering the dockyards of Hong Kong in March 1948 by 17-year-old Ordinary Seaman George Hickinbottom, a member of the crew of the British frigate HMS Amethyst stationed in the city in the late 1940s. At this stage, it is thought Simon was approximately a year old, and was very undernourished and unwell. Hickinbottom smuggled the cat aboard ship, and Simon soon ingratiated himself with the crew and officers, particularly because he was adept at catching and killing rats on the lower decks. Simon rapidly gained a reputation for cheekiness, leaving presents of dead rats in sailors’ beds, and sleeping in the captain’s cap. The crew viewed Simon as a lucky mascot, and when the ship’s commander changed later in 1948, the outgoing Ian Griffiths left the cat for his successor, Lieutenant Commander Bernard Skinner, who took an immediate liking to the friendly animal. However, Skinner’s first mission in command of the Amethyst was to travel up the Yangtze River to Nanjing to replace the duty ship there, HMS Consort. Halfway up the river the ship became embroiled in the Amethyst Incident, when Chinese Communist gun batteries opened fire on the frigate. One of the first rounds tore through the captain’s cabin, seriously wounding Simon. Lieutenant Commander Skinner died of his wounds soon after the attack. 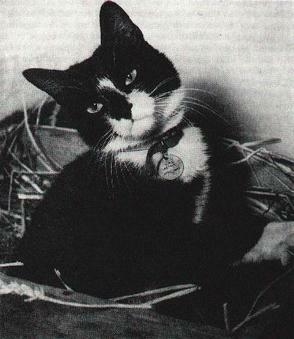 Following the ship’s escape from the Yangtze, Simon became an instant celebrity, lauded in British and world news, and presented with the “Animal Victoria Cross”, the Dickin Medal; as of 2018, Simon is the only cat to win the award. He was also awarded a Blue Cross medal, the Amethyst campaign medal, and the fanciful rank of “Able Seacat”. Thousands of letters were written to him, so much that one Lt. Stewart Hett was appointed “cat officer” to deal with Simon’s post. At every port Amethyst stopped at on its route home, Simon was presented with honour, and a special welcome was made for him at Plymouth in November when the ship returned. Simon was, however, like all animals entering the UK, subject to quarantine regulations, and was immediately sent to an animal centre in Surrey.